It’s that time again, the Fourth of July weekend. Time for celebrating the many freedoms and privileges we’ve been afforded. Time for good food, tasty barbecues, fun times with friends and family, and plenty of fellowship whether it be around the picnic table or by the side of the pool. One of the staples at all of our Independence Day celebrations is pasta salad. And not necessarily the same pasta salad every year either. I recently decided to lighten things up, you know from our typically ‘heartier’ pasta sides, for the warmer weather of Spring & Summer. This new spin on a timeless classic is packed with fresh, crisp veggies, tossed with a ginger dressing laced with Asian flavor, and then topped with a generous sprinkle of fresh, sliced green onions and lightly toasted sesame seeds. So if you’re looking for something a little bit bold, a little bit different, but totally fresh, consider bringing this to the potluck table this weekend. It pairs perfectly with just about anything a cookout can throw at you. 1. In a small skillet, over medium heat, toast the sesame seeds, about two minutes or until they’ve turned a light brown. Set them aside. 2. Use a fine grater to grate the ginger into a fine sieve placed over a small bowl. Press out the liquid with the back of a spoon to get the juices out. Should yield about 1 1/2 tbsp worth of liquid. To the ginger juice, add the mustard, vinegar, sesame oil, sugar, and soy sauce. Whisk all the ingredients together until the dressing is smooth. 3. 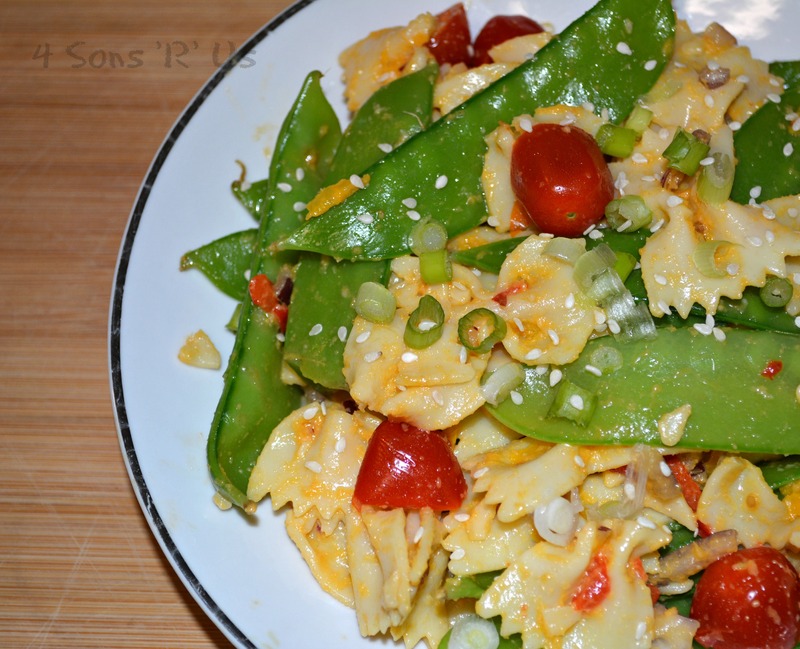 In a large mixing bowl combine the cooked pasta, snow peas, diced pepper, chopped celery, and the dressing. Toss until everything is coated, and then put it in the refrigerator to chill. Serve cold, making sure to toss everything again right before hand. This looks fantastic! I love pasta salads (especially those that don’t involve mayo, like this one)…they’re the perfect summertime meal. Have a happy Fourth of July! Thank you! And I love a good pasta salad with mayo, but sometimes it’s just too much especially when we’re going to be outside in the heat and I’d have to worry about it spoiling! 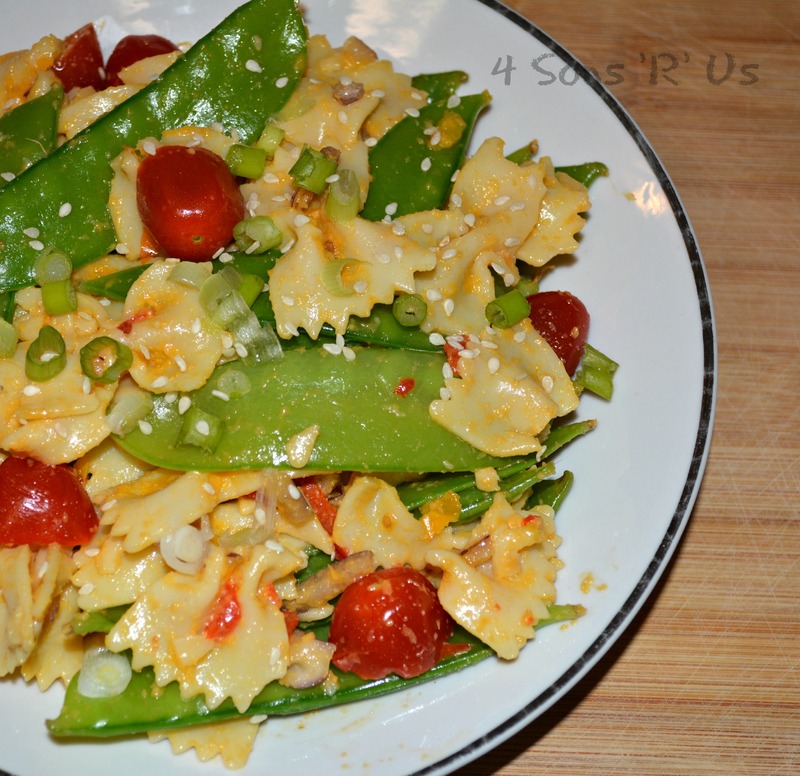 I love how you described this pasta salad! …and that it has a more unique flavor profile to offer that the more typical sides- especially at a pot luck or cookout. Nice! Have a wonderful 4th of July celebration & Happy Fiesta Friday! Thanks, Josette! That’s what I was hoping to convey, exactly!! And I love it since at our potlucks we usually end up with several types of pasta salad, and they’re almost all always mayo-based.